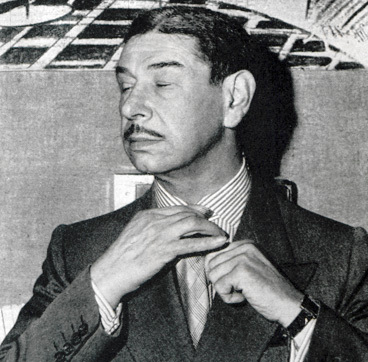 For most of the 1940s and 1950s, Prince Mike Romanoff was one of the best-known and best-loved figures in Hollywood. A man of great generosity and unparalleled charm, he not only owned and ran the swankiest restaurant in Beverly Hills, but was also a close friend to many of the stars who thronged there to see and be seen. Romanoff (1890-1971) was one of Humphrey Bogart’s most cherished companions, and a favourite acquaintance of David Niven, who wrote a warm and admiring appreciation of him in Bring on the Empty Horses, his best-selling book of Hollywood anecdotes. By the time he appeared as a guest on the panel show What’s My Line [1957; below], Mike was so well known that, almost uniquely, the panellists had to be blindfolded, and, to prevent the immediate identification of his distinctively fruity British accent, he himself was permitted to communicate only with a whistle. 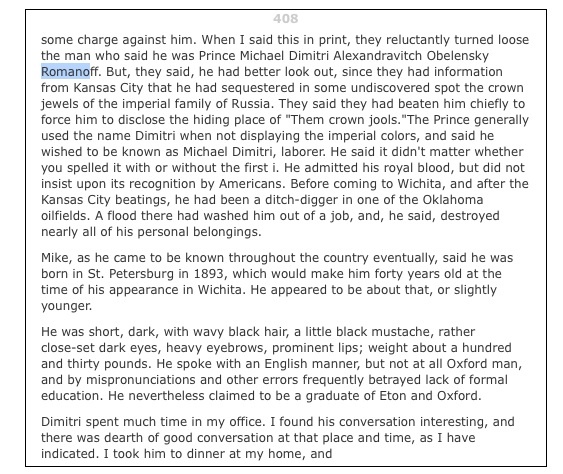 All of this might have been considered par for the course for someone who full styling was Prince Michael Alexandrovitch Dmitry Obolensky Romanoff; who habitually smoked cigarettes monogrammed with the imperial Russian ‘R’; and who had been schooled at Eton, at Harrow and at Winchester, and attended not only Oxford and Harvard, but also the Royal Military College at Sandhurst, Cambridge, Yale, Princeton, the Sorbonne and Heidelberg. 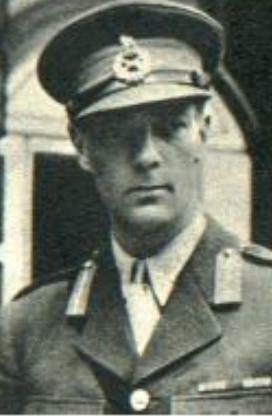 It might have been only a little remarkable for a man who – at least according to his own account – had driven a taxi for the French army during the defence of Paris and then fought on the Western Front as a British lieutenant, and on the Eastern Front as a Cossack colonel; who “knew the Sudan like the back of my hand”; who had won the Legion d’Honneur for some act of unspecified gallantry, and had gone on to defend the Winter Palace against rampaging Bolsheviks; had served six years in solitary confinement for killing a German nobleman in a duel; and who was able to produce at least some proof that he enjoyed a close, if oddly hazy, relationship with the former ruling dynasty of Russia. [Niven pp.147, 150, 152; Johnston, Education pp.247-9] It was, however, a truly startling achievement for a man who had actually done none of those things, and who was, in reality, no sort of aristocrat at all. 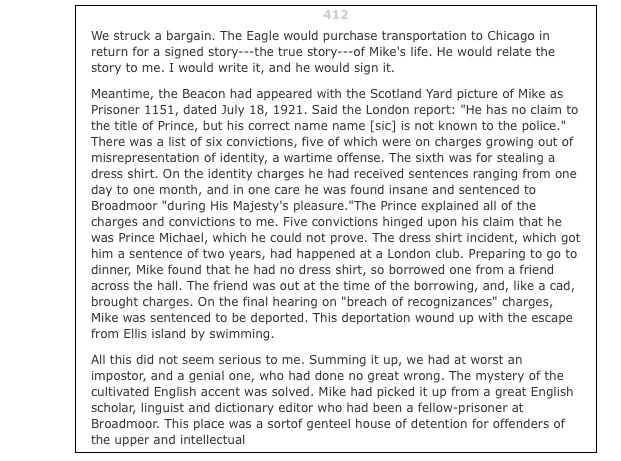 Mike, who stood little more than five feet tall, and might, in the opinion of one critic, “have been more plausible as the Great Mogul or the Akhoond of Swat” than as a Russian prince [Johnston, Downfall p.11], had been born altogether far more modestly as Herschel Geguzin, and had begun life as the son of a dried-goods merchant who owned a shop in Vilna, Lithuania – then part of the Russian empire, and then subject to intermittent pogroms that made life difficult and dangerous for its Jewish inhabitants. Geguzin’s father died before he was born, and, coming to the United States alone at the age of 10, the future Prince had passed most of what was left of his childhood being shunted from children’s asylum to reform school in the poorer districts of New York, “the celebrated bad boy of six New York orphan homes to which he was successively committed.” [Johnston, Education p.246] The remainder of it Geguzin – now known by the crudely Anglicised name of Harry Gerguson – spent working, rather in the style of Anne of Green Gables, as an orphan farmhand in Illinois. 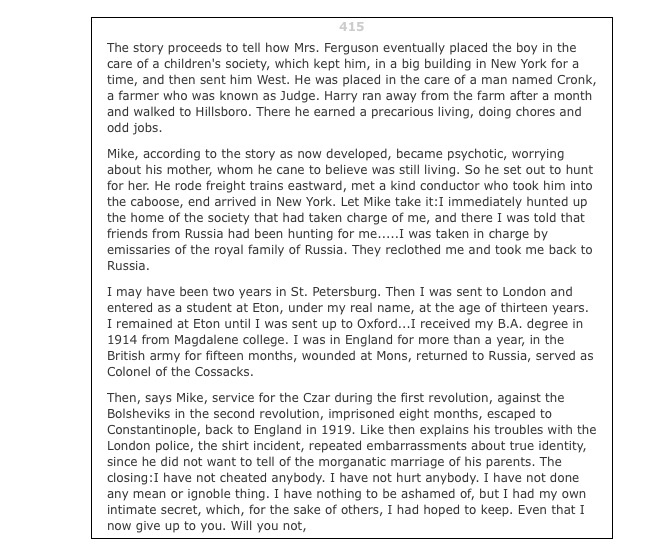 [Pejsa pp.10, 17-22] Mike’s reinvention of himself as a respected, self-possessed and wealthy Hollywood businessman is, thus, a great American story: a triumph of grit, chutzpah and good humour over the sort of grim circumstance that destroyed the lives of tens of thousands of less remarkable individuals. What lends his story true greatness, though, is the sheer vivacity and style with which Geguzin persisted in playing his part, despite repeated exposures and the occasional jail sentence. 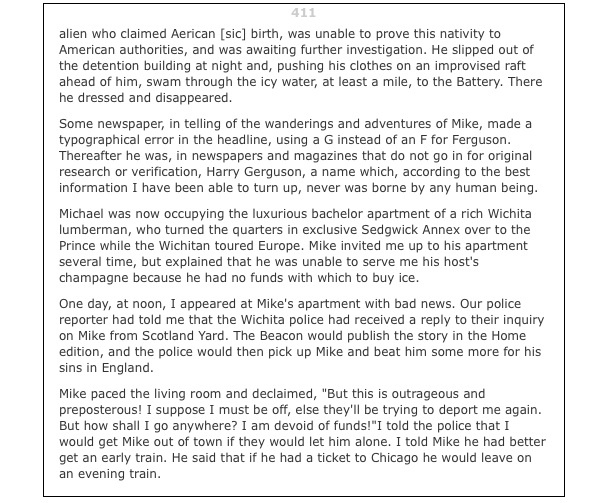 From Cambridge, Alva Johnston’s researches show, Mike travelled to the Midwest, where he popped up successively in Wichita, St Louis, Chicago and Kansas City. He was arrested in Manhattan, but enjoyed a fairly successful social season in Newport, where the evidence suggests that he contrived to attend a ball given by the Vanderbilts. Throughout this period, he lived on “loans” fraudulently obtained on the basis of false promises of repayment, and by persuading sundry art dealers to let him have works of art that he convinced them he could sell, on commission, in the Russian colony. 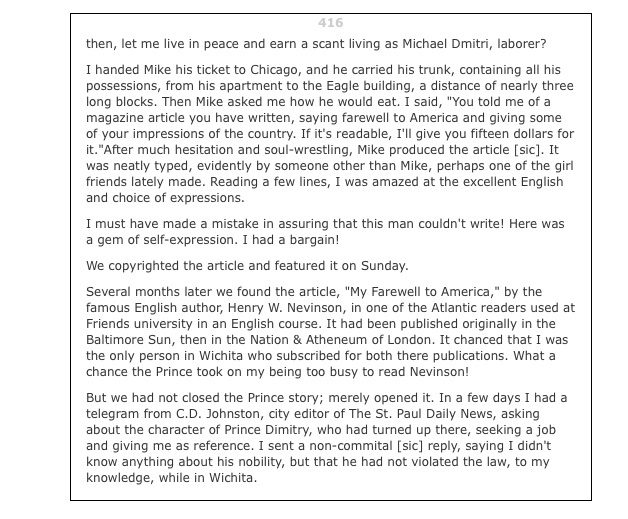 [Johnston, Education pp.249-57] In short, the Prince became a confidence man, and a pretty good one, too. Being a successful con man demands an unusual combination of precisely the personal qualities with which Mike was well supplied. Intelligence is of critical importance, naturally – not academic talent, helpful though that is, but the ability to think swiftly on one’s feet, to vary one’s story according to the circumstances, and to keep tabs on an ever-lengthening list of lies. Ego, in the form of an invincible self-confidence is crucial, too; so is charm – by the bucket-load wherever possible. A certain psychopathic streak, however, rarely goes amiss, for con men, in order to con, have to become intimate with their victims, and hence they understand, better than most criminals, just what damage they are doing to their marks’ bank balances and their self-esteem. It was only in this last quality that Mike was lacking, but, in the end, it was his very lack of ruthlessness that proved to be the making of him. 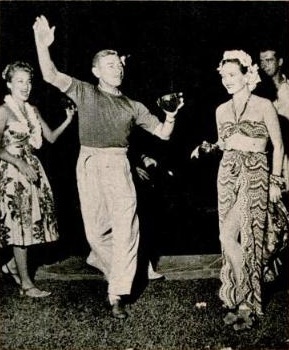 Prince Mike dances an impromptu hula at a Hollywood party, 1946. It is for this reason, one presumes, that there are relatively few examples of a successful con man going straight. Herschel Geguzin, however, was the exception that proves the rule, for, over time, the endless trouble of taking petty scores off those he had been forced to expend considerable effort on, to turn them into friends, began to seem less and less worthwhile. 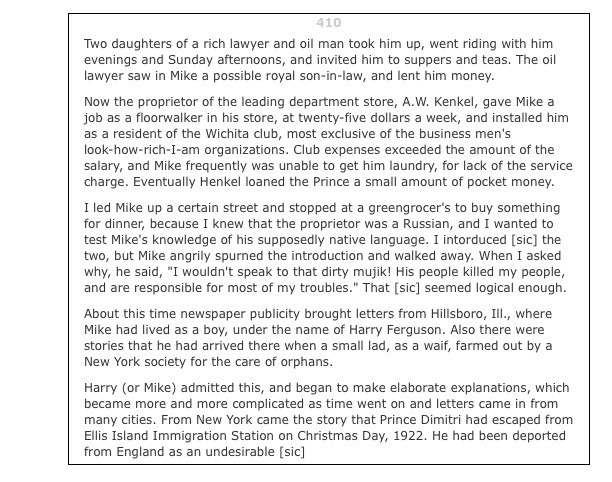 He began to experience a hankering to settle down – one that was almost certainly compounded by a temporary deportation (one disadvantage of the Romanoff ploy was that Mike was unable to prove he qualified for American residency) followed by a six month jail sentence, served in France for vagrancy. Two more years back in New York, fighting a second deportation order and, more problematically, the worst effects of the Great Depression, were enough to convince the Prince it might be better to go straight. [Pejsa pp.87-98] In the autumn of 1936, helped by the few friends who were in funds in Gotham, he acquired an old Ford convertible and set off for the west. Hollywood was beckoning. prevailed upon him to come in for at least part of every evening, with the promise that he would win well from time to time. What worked for the Clover Club also worked for Mike, who prided himself on his poker bluffing skills. He soon contracted with James Oviatt, the best haberdasher in town, to furnish him with an entire wardrobe suitable for his ascending Hollywood position. Mike paid the bill a few dollars each month, and later Oviatt proudly attested to the fact that his customer always paid on time. The Clover Club was practically a Hollywood institution. Moguls and stars went there to play for especially high stakes. I went to look, and, maybe, place a small bet. But the crap games and chemin de fer were out of this world: ten thousand dollars on the line, ten thousand back of the line. I stood in the corner with my hundred dollars in chips and timidly placed it on “don’t pass,” figuring that if they were going to get anyone, it wouldn’t be me. “Put it on the pass line,” whispered a gravelly voice with a bit of an English accent. He sounded so authoritative that I did as he said. David Selznick made seven on the opening throw, doubling my money for me. “Keep it there and take the odds,” the guiding voice urged. I followed his directions for about four rolls. Then he said, “Take your money away.” I did, turning from the table with five hundred dollars in chips. “You owe me twenty percent,” said the man, who, I now saw, was imperious-looking and impeccably dressed. I gave him one hundred dollars and asked his name. This encounter began a friendship that lasted thirty years. David Niven: actor, writer, raconteur and close friend of Herschel Geguzin. Mike struck gold. He obtained an option on the lease of a defunct restaurant… His friends became stockholders in the shoe-string enterprise and the place reopened in a blaze of black ties, mink, well-known faces and publicity. I am commanded by His Imperial Highness Prince Michael Alexandrovich Dmitry Obolensky Romanoff to request your presence at a soiree he is giving in his own honour. Bring your own wine and kindly fee the waiters. Le tout Hollywood turned out in force, and so many people brought wine that few realised the place had no arrangements whatever for cooking. A sparse menu was serviced by a nearby hash joint on a strictly cash basis (the money collected for the first two ‘couverts’ started the ball rolling): a riotous evening was had by all, and enough money was raised to install a kitchen and launch Mike on a fabulously successful career as a restaurateur. Mike Romanoff with his bride and business manager, Gloria Lister, 1947. Johnston givens no other details of this short period in Mike’s life, and both Pejsa and Niven ignore the interlude. Recently, however, I found a full account of those few weeks in an unpublished typescript written by Charles B. Driscoll, a newspaperman with the Wichita Eagle who, even 20 years after the fact, retained – as did Swifty Lazar – an indelible impression of the eruption of the Prince into his life. There is enough to say about Mike Romanoff to make a shortish book, and this post has already gone on long enough. 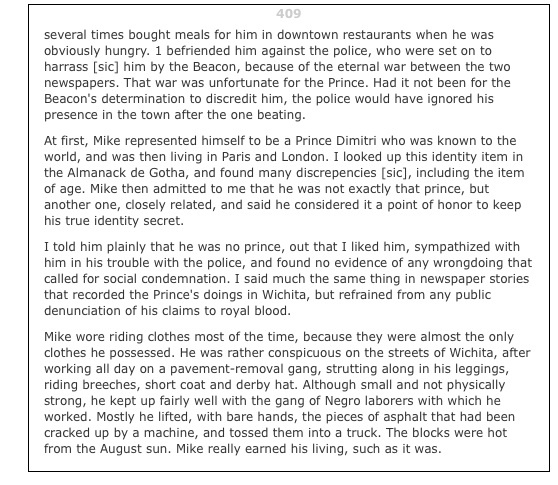 But I cannot close without revealing just a little more about Mike’s antecedents, even though this final tale raises a good many more questions than it answers. Even though by now he was playing his imposter role for a different effect, he still used the trappings of his calling, wearing an Old Etonian tie one day and a Brigade of Guards scarf the next. His conversations still pulsated with ‘when I was up at Oxford,’ ‘during my time as Sandhurst’ or ‘he was a classmate of mine at Harvard’. “Who was your housemaster?” he asked. It was Mike’s British accent that always fascinated me. I could never put my finger on it. It was the sort of camouflage that English curates perfect to cover up honest Cockney voices. This ‘plummy’ delivery never left Mike and even on the very few occasions, those testing times when he took a glass or two too many, it remained as much a part of him as his bristly crew-cut pate and his military moustache. Over luncheon I sought to enlist Mike’s help for a project of my own. Robert Laycock was coming to visit me and I wanted Romanoff’s to cater for a party I was planning for him. Wiseton was indeed the Laycock home in Lincolnshire and Sir Joseph was certainly Bob’s father so I could not suppress a start of surprise. Mike noticed this and pressed home the advantage. Mike had obviously had reason somewhere along the line to research the Laycock family very carefully, but the mental picture of him in blazer and white flannels, sitting in a deck chair, sipping tea and eating cucumber sandwiches while waiting his turn to bat was too much even for me. Back at Mike’s white stucco residence on Chevy Chase Drive, he took me up to his bedroom: there he nonchalantly displayed a pair of ivory hairbrushes. The ivory was a little yellow with age, but what brought me up standing was the insignia in worked silver on their backs. It was something I knew very well – the crest of the Laycock family. “A present from old Joe,” said Mike smugly. Bob Laycock duly arrived on his visit and the party catered by Romanoff’s was a great success. I had warned Bob about Mike and hoped against hope that Mike would stay off the subject of Wiseton. Far from it. For a large part of the evening, Mike cornered Bob, who seemed to be thoroughly enjoying the company of the Mini-Monarch, from whose expressive gestures I could see from across the room that both cricket and hairbrushes were being discussed at length. Nothing awful happened, however, and the happy guests finally departed. After they had gone, Bob and I had a night-cap and held the usual post-mortem on the evening. “What did you think of Mike?” I asked. Prince Michael Alexandrovich Dmitry Obolensky Romanoff remained enigmatic when I tried to pump him. Anon. 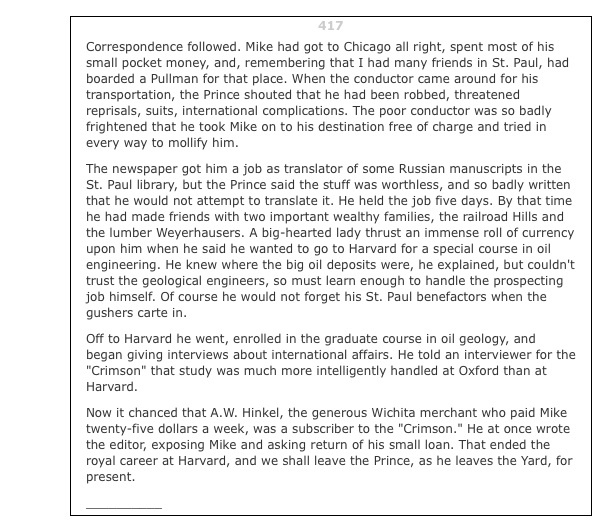 “Russian ‘Prince’, notorious in university last fall, wanted on charge…” Harvard Crimson, 24 March 1924. Anon. “Mike’s place.” Time, 6 November 1950. Alistair Cooke. The Americans. New York: Alfred A. Knopf, 1979. Charles B. Driscoll. East and West of Wichita. Unpublished, undated typescript (c.1948) in the Western Institute of Irish Studies, Stanford University. Alva Johnston. “The downfall of Prince Mike.” Saturday Evening Post, 20 March 1942. __________. 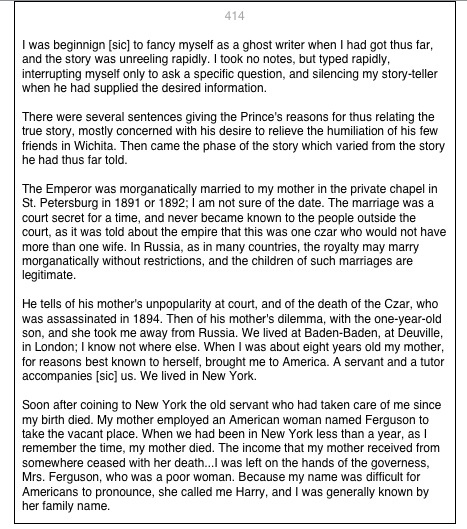 “The education of a prince.” In David Remnick (ed)., Life Stories: Profiles from the New Yorker. New York: The Modern Library, 2001. 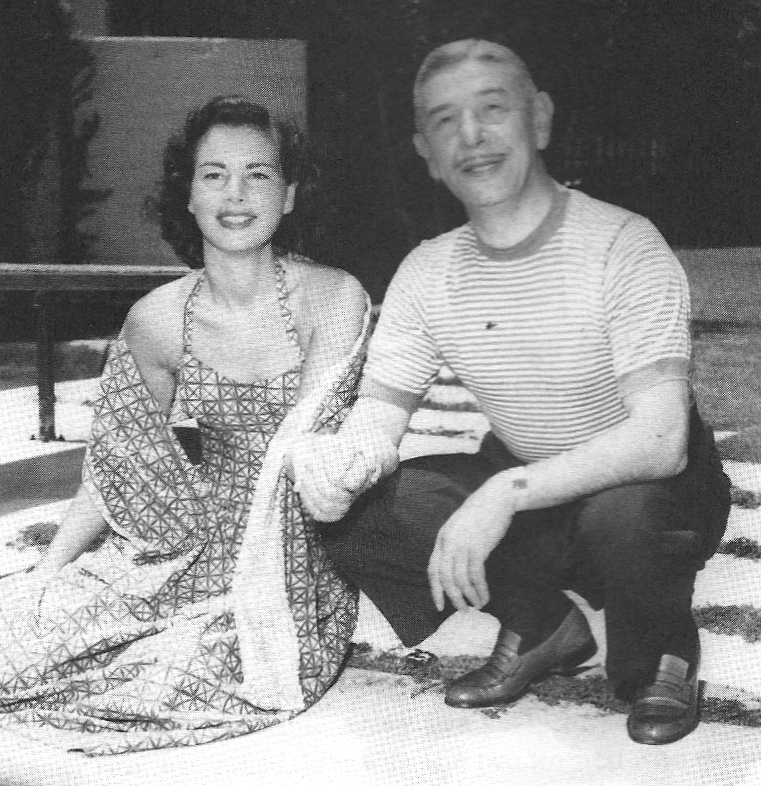 Irving Lazar, with Annette Tapert. Swifty: My Life and Good Times. New York: Simon & Schuster, 1995. David Maurer. The Big Con: The Story of the Confidence Man. New York: Anchor Books, 1999. 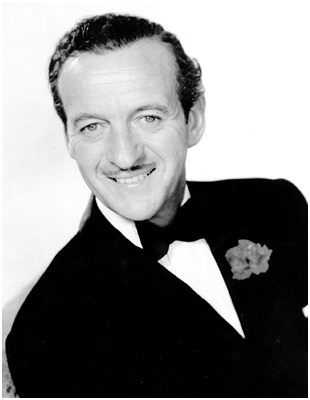 David Niven. “The Emperor.” In Bring on the Empty Horses. London: Hodder & Stoughton, 2006. Jane Pejsa. Romanoff: Prince of Rogues. The Life & Times of a Hollywood Icon. Minneapolis: Kenwood Publishing, 1997. What an interesting man. I would have loved to meet him. Thanks for the introduction! You would have loved it, indeed. While I am aware it is highly unlikely that my uncle Mike was actually related in any way to the Russian royal family, I can say with no hesitation that he will always be a prince to me. He went to extraordinary lengths to make a small boy happy. The birthday extravaganzas that he prepared for me when I was less than 10 years old are memories that I will always cherish. He was kind and generous and fun and so very debonair. A true old world gentleman in every sense of the word. In case you are wondering, his wife Gloria was my father’s sister. 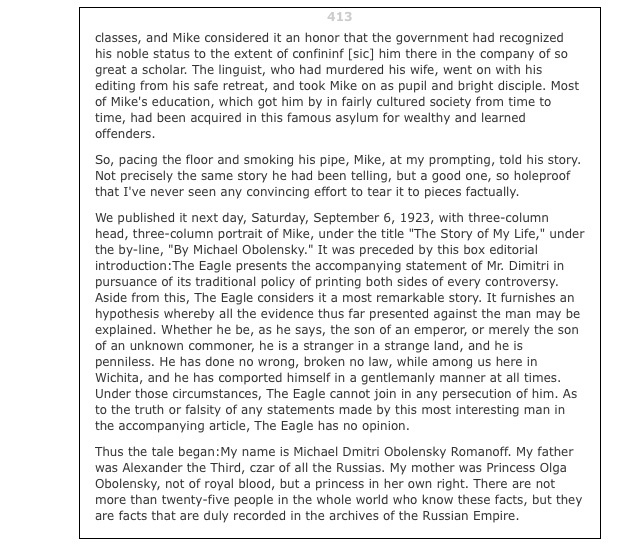 An old boss of mine had a real-life business partner named Andrew Romanoff, who grew up amongst royalty in England (but now lives in Northern California) – he had stories about growing up as Tsarist royalty but being penniless and having to bum cigarettes from the household staff! A very interesting story and a very interesting man. This article is great. Maybe you could check this Wichita Family Lawyer .